The skymirror swimming pool is spectacular. It is the only one that completely cancels the limits of the pool. It subtly merges with the surroundings and is at one with the landscape. Your skymirror swimming pool becomes a water spot well integrated into your garden. 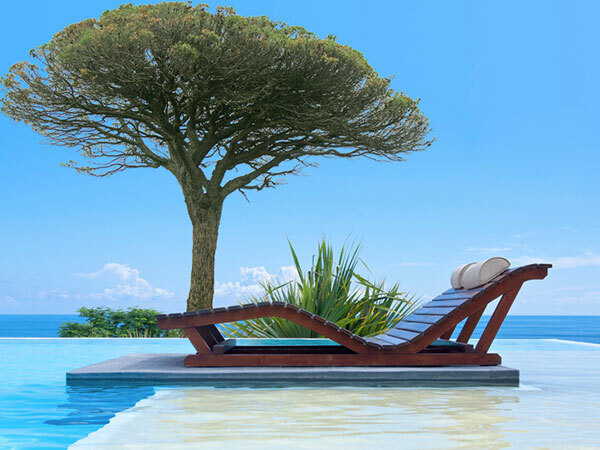 For comfort and elegance, you can arrange a pool beach on the same level as water. That way, it will be even nicer. Depending on the configuration of your garden, if your skymirror swimming pool can be built in order to overhang the landscape, the water fall will merge with the horizon and the illusion will be amazing. This is what your skymirror swimming pool is all about: a bathing spot right in front of a spectacle open on the horizon. The skymirror swimming pool offers top-of-the-range aestheticism and luxury. The water of a skymirror swimming pool is always very clean because floating elements such as insects and leaves are quickly driven towards the edges to be evacuated through the buffer tank which retrieves the flow of surface water. A perfect skimming is thus ensured, without any skimmer, through the four sides of your swimming pool. The construction of a skymirror concrete swimming pool requires a strict precision so that the overflow of water is everywhere on the same level and with the same flow. This kind of project cannot be performed by any pool builder, but must be entrusted to a concrete swimming pool specialist. MARINAL’s excellence on the matter offers you a clean result. For a perfect result, there is nothing better than concrete for this type of construction; and MARINAL is a concrete expert as it is its core business. A skymirror swimming pool is a top-of-the-range product and its construction is quite particular. This makes it a rather expensive swimming pool. The price of a skymirror swimming pool will also depend on its surface and especially on the constraints of the ground for its levelling works. For a precise study of your project of a skymirror swimming pool, please contact MARINAL for an appointment, using our on-line contact form.